CES 2009 is officially under way, and we were there to experience all the action. We covered quite a bit of ground, and I'll highlight the Sandisk 2009 Press Conference where they unveiled a couple new products. I'll also cover our visit with Super Talent. 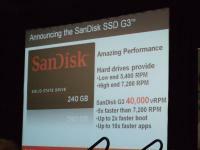 Sandisk's press conference this year focused mainly on two main released, first of which was their new line of SSD drives. 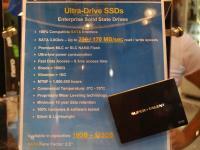 These drives are boasting some impressive specs, as well as a very affordable MSRP at launch. As you can see in the slide above the SSD G3 boast speeds up to 5x faster than a 7200 RPM drive (approximately 40,000 RPM). It will be very interesting to see these drive when they launch as the numbers they are claiming could really make your laptop or home PC much faster for everyday tasks. 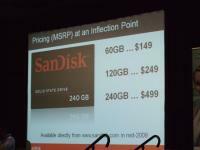 Also as you can see in the above slide, the SSD G3 line from Sandisk will have a very affordable price tag at launch. While traditional storage is still less per GB, the G3 will make it affordable for users that don't require as much space, and for applications like laptops where bumps and drops may occur, this line of drives could become very very popular. 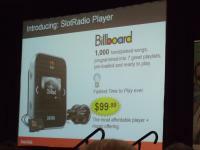 The other big announcement was the SlotRadio player from Sandisk. SlotRadio is a addition to the new SlotMusic concept that Sandisk has recently released. If your unfamiliar with SlotMusic follow this link for more information. SlotMusic is basically the ability to purchase new albums on a microSD card and play it in most MP3 players or phones that support audio and have a microSD card slot. SlotRadio is going to use the same concept, but they are going to put 1000 songs on a microSD card that will be able to by inserted into a SlotRadio player and with one click you'll have your own radio station available (all songs on SlotRadio cards will be DRM protected, so you'll be unable to copy them off the microSD card). Additional SlotRadio cards will be available with different genres of music will be available at the price of ~$40 USD for 1000 additional songs. The biggest selling feature of the SlotRadio players and additional cards will be that you can easily add 1000 songs of a particular genre that you like for relatively cheap and without the hassle of downloading and syncing. 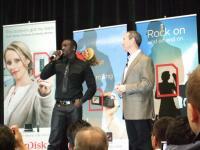 The first artist to adopt the new SlotMusic idea and release a full album on SlotMusic the same day that he released his newest album was Akon, who made a guest appearance at the press conference to talk about the reasons he wanted to be part of the SlotMusic and SlotRadio product line. We had a chance to stop by the Super Talent booth today and get a quick look at their newest products. 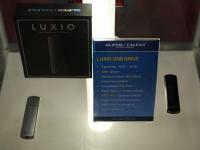 The picture above shows Super Talent's new line of flash drives, named Luxio. These USB flash drives come in 16-64GB varieties and have a pretty nice look to them. Although Super Talent has released their SSD drives a while back, they are still heavily promoting them and if you've been keeping an eye on SSD drives, you've probably noticed that Super Talent has one of the more affordable drives on the market today. 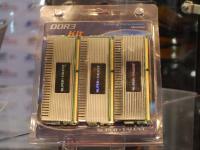 Also shown was Super Talent's new line of Triple Channel DDR3 kits, available in 3 and 6 GB kits to support the new i7 platforms.